The latest two adventures for our Dime Novel and Popular Literature Collection are an online bibliography and a podcast. A couple of weeks ago we launched dimenovels.org, the Edward T. LeBlanc Memorial Dime Novel Bibliography. This project aims to create a comprehensive online database of dime novels, story papers, reprint libraries and related materials. It is important to note that this is very much a work in progress, as we have only just begun entering data. 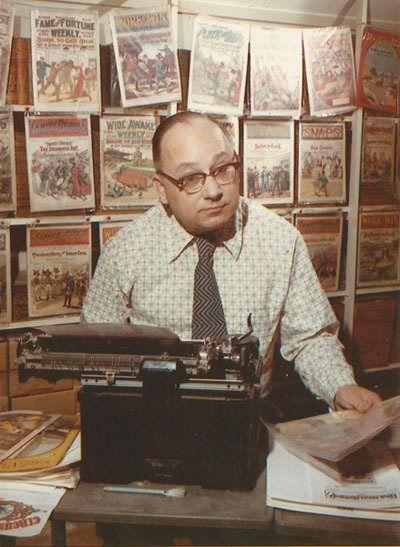 Edward “Eddie” LeBlanc was the editor of Dime Novel Round-Up from 1952 to 1994, and he devoted many years of his life to compiling extensive lists of dime novels and related materials. With the permission of the LeBlanc family, we are using his research as a foundation for this project, while also incorporating information from various other sources. If you are interested in helping with the project, we would love to hear from you! See the project’s about page for details and contact info. You can follow updates from dimenovels.org on Facebook and Twitter. 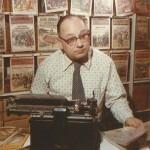 Dimenovels.org is also host to The Spare Change Library, the dime novel and popular literature podcast, launched in May. The podcast will feature audio editions of stories, as well as scholarship. Currently, we are recording an audio version of Mrs. Alex. McVeigh Miller’s The Bride of the Tomb, a thrilling tale of mystery and romance. A new chapter is released each week on Thursdays (with the exception of major holidays). You can follow The Spare Change Library on Twitter and also check out our production blog.